3.3 How do I add a transformation to JWT? In this page, transformation stands for a transformation of a workflow from one format to another. Since JWT workflow file type is the core of this project, the term import will stand for transformations that produce a JWT workflow file, and the term export will stand for transformations that produce a description of a workflow into another format, from JWT. The aim of transformations is to make possible to use workflows designed with JWT in another contexts, and vice versa, all the more since the JWT workflow (file) format is on its own not a standard used by other workflow editors or engines. In fact, transformations are the basis of compatibility, and what makes of JWT a bridge between various tools and platforms, not only in the workflow domain but also elsewhere like e.g. 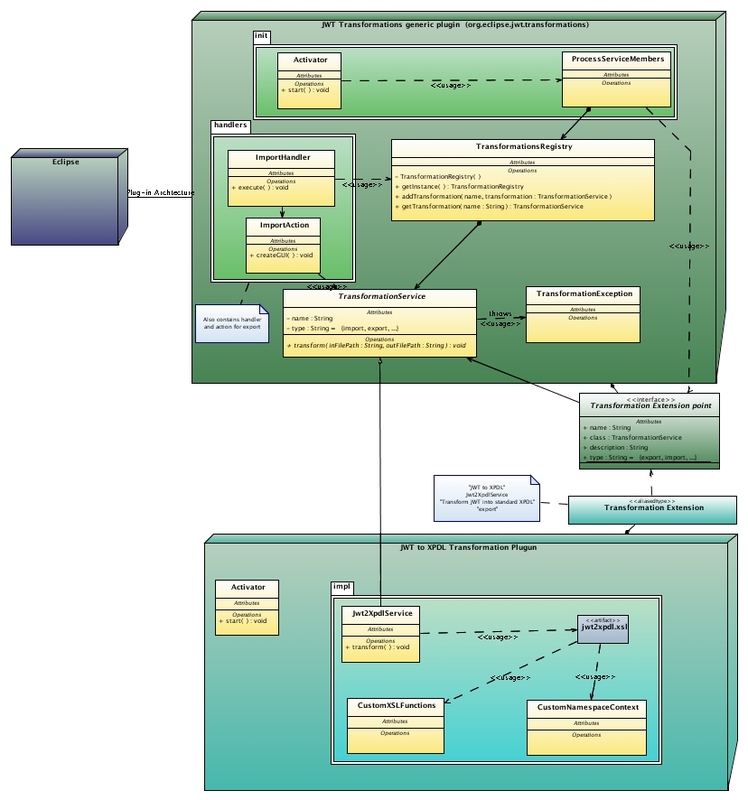 SOA, or conceptual diagrams, allowing to use them all together. You need a JWT WE with the jwt-transformations-base plugin installed as well as any transformation plugin you want to use, for example jwt-bpmn or jwt-xpdl. This makes available "Export" and "Import" buttons in the JWT WE toolbar, and under those any transformations provided by the installed plugins. To use for example the XPDL transformation, choose Export, and there choose JWT2XPDL in the dialog box ; fill in the output file name, and start the transformation by clicking on OK.
Alternatively, do File->Export from the main toolbar after opening the workflow model in eclipse. Type "Export process" in the filter text area, and then choose Java Workflow Tooling->Export process into another metamodel. Select one of the transformations: XPDL, STP-IM, BPMN according to the format you want to export in. XPDL is an XML-based, executable workflow language standardized by the WfMC. Only export JWT to XPDL is available. But there are some limitations. Scarbo provides an enriched version of it. Produces executable XPDL that has been validated on the Bonita 4 workflow engine. See the JWT2XPDL documentation for extensive specifications. jPDL is jBoss jBPM's XML-based executable workflow language. BPMN is a business process representation format standardized by the OMG. Here we use the (EMF-based) XML format defined by STP's BPMN editor. and one the other way round (from BPMN to JWT). STP-IM is an SOA intermediate model by the SOA Tools Project dedicated to help bridging SOA-minded problematics and concerns. We have a transformation from JWT to the STP Intermediate Model (STP-IM). This intermediate model allows the further development of JWT in SCA, BPMN, BPEL, etc. Activator is called on the generic transformation plug-in. This activation calls the ProcessServiceMember.process method, which will get all informations to get informations from the extension point and add it to a registry that will be use later. (This mechanism is done as explained at http://www.eclipse.org/articles/Article-Plug-in-architecture/plugin_architecture.html) This part of the code is used only once, at activation. If necessary, it is easy to add some metadata to a transformation. To do it, just add an attribute to the extension point, add it as an attribute to the transformationService class, and set it when you load the extension is ProcessServiceRegistry. How do I add a transformation to JWT? Of course, it requires org.eclipse.jwt.transformation.base plug-in. You just have to implement a class that extends TransformationService, with its method transform (that will be called to apply the transformation). Then, you create an extension for the extension point org.eclipse.jwt.transformations that defines a name for your transformation and the class that implements the transformation (extending TransformationService), and more other optional fields. Take a look at the extension of StubTransformation from JWT repository to give you a concrete example. XSL transformations allow to transform a JWT workflow model (and its model extensions) from its own (EMF based) XML representation to any kind of XML or text, by writing an XSL template. It is a good all-around choice if you want to get XML or simple files (csv...) out of your workflow model. For XSL transformations, there is a tool plugin called jwt-transformations-xslt-tools which contains some stuff to call XSL transformations and some extension classes that can be used to "introspect" the JWT XML model file. ATL transformations allow to transform the JWT workflow model (and its model extensions) from its EMF model to another EMF model, by writing a model-to model transformation in the ATL language. It is less common and more complex, but a powerful choice, especially if you already have an EMF version (.ecore file) of your target model. Note that if you don't have it, you have to find or write an ATL compatible version of your model first, for instance with the XML2Ecore tool if your target model is in XML. there is no JWT plugin that gathers useful ATL stuff for JWT yet, but you can have a look in existing ATL-based transformation plugins (jwt-bpmn, jwt-stpim...), or even copy-paste one of them as a basis. an ATL based transformation plugin requires the org.eclipse.m2m.atl.engine plugin. to compile the .atl file to its .asm executable couterpart, give to your project the ATL nature (right-click on project > Add ATL Nature). This gives it the ATL Builder, which will automatically compile all .atl files of your project. However you may not want to keep the ATL nature all the time (and remove it, by right-click on project > Remove ATL Nature), because it inclines to regenerate all .asm files a bit too often, which is meddlesome notably when working with source versioning. Remark: You can see that this piece of code loads directly ATL compiled files (*.asm) instead of ATL files. We could easily generate asm files from ATL at runtime using ATLCompiler class; however, it is better to assume that we have the compiled version of transformations. This way, we avoid compiling each time we call a transformation, and make the transformation faster. This page was last modified 10:51, 11 October 2012 by Yoann Rodière. Based on work by Mickael Istria, vpathak and Marc Dutoo and others.